We are so proud of you, Jeremiah! WE LOVE TO TELL THE STORY……. If you have been reading our newsletter for very long, you know that we love to tell stories of former clients and how they have beat the odds. This is a very special story of an incredible young man named Jeremiah. A medical mistake that was not followed up on made an enormous difference for baby Jeremiah, and his mother, LaTonya.The doctor thought that LaTonya was only 23 weeks pregnant, when in fact she was almost 25 weeks along. This may not seem like a lot, but in terms of development of a baby, it is a huge deal. A simple check of the dates would have revealed the doctor’s mistake (he was in a rush) but the hospital didn’t have a system for double-checking or verifying this critical information. If the doctor had known that the baby was actually 25 weeks, he would have given LaTonya steroids to help with the development of Jeremiah’s lungs and he could have given her other types of assistance he did not make available. As a result, Jeremiah was born prematurely with major complications, including a brain bleed, trouble breathing, and he had to use a feeding tube. Instead, Jeremiah was born prematurely just shortly after LaTonya had been sent home from the hospital by her physician. One of the basic provisions for medical malpractice assessment is the standard of care that should be met by physicians, HMOs and hospitals. Correct projections for term of pregnancy and proper treatment of premature babies is part of a standard of care that can be expected from any practicing physician and hospital or HMO. We sued the hospital and the physician on behalf of LaTonya and Jeremiah and won them a significant settlement that is helping LaTonya maintain the care that Jeremiah has required so far and will continue to require due to his prematurity. But, that’s just the beginning of the story. Just the other day we received an update from LaTonya that Jeremiah he will be enrolling in the 7th grade this year. I called LaTonya to get an update on how Jeremiah is doing and it’s no surprise that he is doing amazing! LaTonya used the word “proud” about 5 times during the conversation, which was awesome. Jeremiah is really doing well. 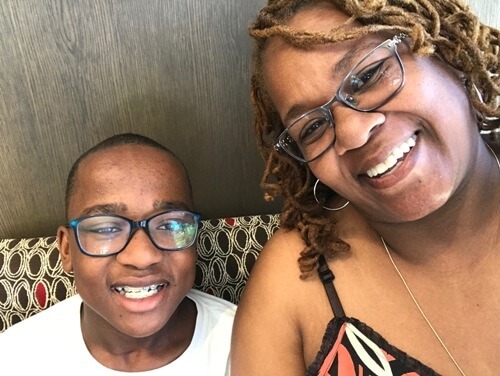 He goes to middle school this year and he is beginning to navigate away from the assistance that he has been receiving in the special programming there at his school. In elementary school he has been using a “para-educator” which is a full-time assistant to help Jeremiah stay on top of his education and socialization skills. Although he did experience some bullying in elementary school, Jeremiah is exhibiting more and more confidence every day and is blossoming under the influence of his older brother, who is thirty years old and spends a lot of time with him. LaTonya told me about how he is developing his own style, that he wants to look “more fly,” this year. He is also “working through his anger issues and taking responsibility for his own behavior,” which is pretty fantastic to hear for any seventh grader! This year Jeremiah will start practicing karate and play soccer. He will also be catching the bus for the first time by himself, a short walk from the school and a straight shot home. We are so proud of you, Jeremiah. Keep up the good work!